Camel broker Saleh Abdul Fadlallah drives a camel at the Birqash Camel Market outside Cairo, Egypt, where camel broker Saleh Abdul Fadlallah works. (Saleh Abdul Fadlallah is featured in the book What I Eat: Around the World in 80 Diets.) Domesticated since 2000 BC, camels are used less as beasts of burden now, and more for their meat. Because they can run up to 40 miles per hour for short bursts, dealers hobble one leg when they are unloaded at the Birqash market. They are marked with painted symbols to make them easier for buyers and sellers to identify. 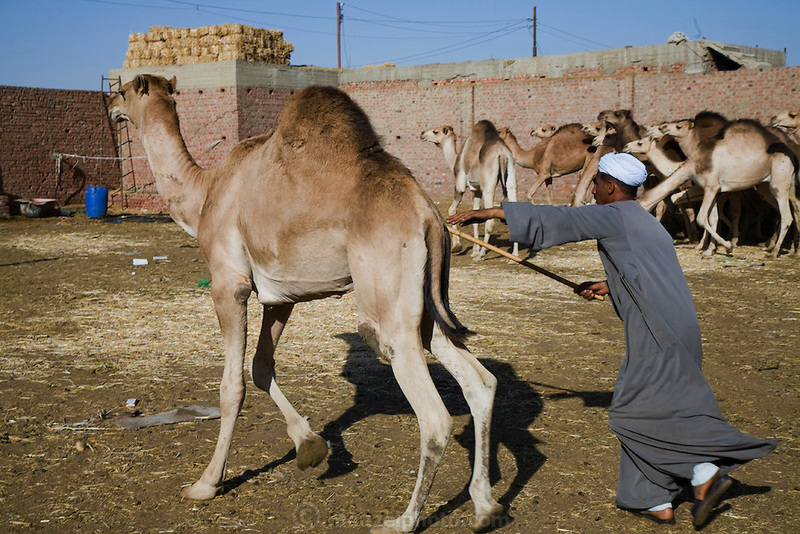 Both brokers and camels have a reputation for being surly, and the brokers don't hesitate to flail the camels with their long sticks to maintain their dominance. MODEL RELEASED.